The weekend has come and gone! I made little progress (almost none) on any embroidery this weekend, though I did manage to do two embroidery-related things. I’ll tell you about those and show you some photos of a little bit of drawn thread embroidery that I worked last week. 1. I played quite a bit with the plaited braid stitch. This does not by any stretch of the imagination mean I created anything beautiful with it. In fact, what I have to show for any efforts along these lines is just a mess. I simply worked with it. I’ll tell you about that when I can take better photos. I don’t know about you all, but does it seem as if the weekends go faster the more you look forward to them? I’ve determined to stop looking forward to weekends, in the hopes that they will last longer if I don’t anticipate them! Sheesh. I accomplished no “real” stitching this weekend. But here are a few photos of some drawn thread stuff I managed playing around with last week. Actually, all I really got done was the inside of that top piece. The rest was finished weekend before last! I kind of like the inside of this – it was spontaneous, and it just happened to work out evenly spaced. I counted off threads in the fabric as I went, and decided to add one more little eyelet here or there to make it even. I’m using #20 coton a broder, and the fabric is 32 count linen. Besides the inside square eyelets up there (it’s actually Algerian Eye stitch, pulled tight to open the middle hole), I stitched one edge on what will be a Ukranian drawn thread motif. I’m working this little bit straight from Yvette Stanton’s Ukranian Drawn Thread embroidery book. Wow. Talk about a good book! If you’re at all interested in Drawn Thread embroidery, you should look this one up! Her instructions are so precise – I don’t think I’ve seen their equal in any other needlework book. She takes you step-by-step (with photos and diagrams) through each practice motif. So I’m going to work one of her little practice motifs here. And that, my friends, is all I have to show for this past weekend! Maybe the week will go better? Let’s hope so! Don’t forget to sign up for my January stash give-away, if you haven’t done so already. Read the original post carefully, follow the directions in answering the question, and leave a comment on the original post! 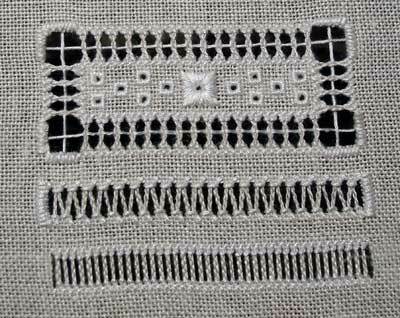 I love the little eyelet sampler. I’m really looking forward to seeing what you do on this sampler. Yes, weekend days go so much quicker than week days. It seems to me that their speed is related to the number of things that I plan to do. The more I plan, the less time there is. Go figure! Mary, when you refer to linen as “32 count”, could you tell me what that means and how it would compare to say ulster or cambric or handkerchief. I am used to buying linen by the thread count I guess so wonder about the difference. 32 count means 32 threads per inch. It is an evenweave fabric, so if you measure either horizontally or vertically (warp or weft), you’ll count about 32 threads per inch. Hi Mary, yes it was me who requesed the Turkey stitch, Thank you. No panic!! And as for the mending pile – lets not talk about that!! Take care of that throat, Mary. A scratchy throat is n ot nice to endure. Love your eyelet panel! I’ve blogged on it today, and tomorrow will follow up with some tips (for others – not you!) on working lovely eyelets. 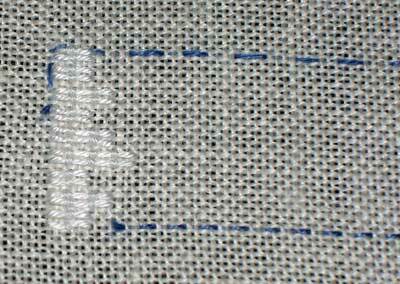 Previous Previous post: Needlelace Tutorial – Excellent Step-by-Step Instructions!